I want to grow Seascape, Albion, Cabot and Elan around 30 plants each of these in my garden from seeds. Are these hybrids or heirlooms. Please specific. Are the seeds of strawberries won’t grow without freezing in the refrigerator even if the seeds are heirlooms. So does anyone have a in-depth guide to grow sparkle strawberries a week from now from seedlings? how long does it take for a strawberry plant to produce fruit? Hi! I live in the Seattle area of the United States. I’m growing some Delizz strawberries from seed (from Territorial Seed) and they are doing well—soon there will be ripe berries to try. They are sending out lots of runners; will those runners be true to type? If so, why aren’t Delizz strawberries available for sale as plants, just as seeds? Should I plant the runners out this fall like we’ve done for our other strawberries? Since I’ve had good success with starting the Delizz seed, I’m thinking about buying some Elan F1 seed. Would it be a bad idea to start the seeds in the late summer and overwinter then with frost protection blankets? Or better to start them in the early spring? I’d love to get a head start on next season and our strawberries seem to overwinter just fine. Of the hybrid type of strawberries are there varieties that can be propagated by seed that retain the characteristics of the parent plant fairly well? If so what varieties would you recommend? Hi I am from Jamaica and growing strawberries in pots, I started growing them from seed . I got 12 sprouts.l would take them outside in the morning to sun the entire day and take them back inside at night, is it OK ? I would like to grow strawberries in Uganda. I think this will be an experiment to start of with and I will try a few different varieties to increase the chance of success. I want to avoid Hybrids so that we can reuse the seeds, unless you know of any hybrid seeds that reproduce well after replanting. I was thinking it might be good to try ever bearing and seasonal varieties. Do you have any suggestions of suitable varieties? We are at 1,000 meters so although we are on the equator we have year round temperatures of about 20 degrees Celsius. Very new to strawberry growing so any advise would be well received. 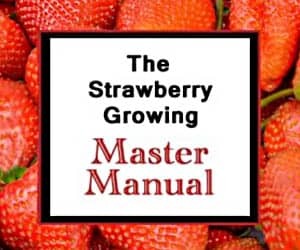 Some good information here on growing strawberries – but I haven’t seen anything like a planting guide for seeds – specifically, WHEN to plant for a given zone. I’m in zone 9 – Central Florida. Should I be planting NOW (June), waiting until later (August?) or??? I’d go ahead and get them planted. They may require a bit of protection from the Florida heat once they germinate, but getting them established is usually best done as soon as possible. Good luck! I planted some Delizz Strawberry seeds a week ago and I already have some sprouting. I’m worried I may have covered some of the seeds too much that aren’t sprouting. Would it be ok to uncover or is it too late at this point? I would leave them be at this point. Not all of the seeds will germinate, usually, anyway. However, Delizz is a hybrid and won’t grow true from seed. Where did you purchase them? Thanks! How do you get strawberry seeds from a strawberry, and if you do will a plant grow? If you look on this page under the Saving Strawberry Seeds heading, it will tell you how. If you collect the strawberry seeds from the strawberries you buy in the store, they may or may not sprout. Those are virtually all hybrids and typically won’t grow true even if they do sprout. The heirloom strawberries or non-hybrid species will grow true from seed. Good luck! I’m from Michigan, and I started growing a strawberry plant, cherry tomatoes and bell peppers all at the same time, from the actual seeds of the fruit/veggie. I’m growing them in containers, indoors, in a window that gets plenty of sun. My tomatoes and peppers have started flowering. The tomatoes have 4 little green tomatoes and lots of yellow flowers. The peppers are right behind with white flowers, no peppers yet, but the strawberry plant is just a nightmare. It’s almost as tall as the window it’s sitting in. And I’ve had to prune the heck out of it because It only seems to grow these fuzzy little bunches of green, things that keeps dropping seeds everywhere. Seeds float to my other two plants and I’ve had to cut strawberry plants out of those pots. There are also different looking leafs in my strawberry plant pot. Wish I could post an image of it. There are no flowers like the ones I see on strawberry websites. It’s not growing flowers at all. Should I dump this beast and start fresh or will it eventually grow flowers and produce fruit when the right season comes? And what are these green fuzzy things growing with all the seeds? It is hard to know exactly what you are talking about without seeing a picture. But, it is possible that what you are seeing isn’t even a strawberry plant. Or, is this what you are talking about? Regardless, good luck! Do Hautbois Strawberry (Fragaria Moschata) seeds require the freezing treatment? Are they similar to Alpine Strawberry (Fragaria Vesca) in this way? Yes, go ahead and cold stratify the seeds, and you will likely get a higher germination rate. Good luck! I stay in Saudi. My strawberry seeds has germinated. It’s Fragole strawberry Rampicanta variety. Can you say me the next step after its sprouted. It’s very hot outside say 35°C and it’s May month. The predicted temp for June and July Vl be average of 40°C to 45°C. And how long Vl it take to fruit from seeds. How many months does it take. And is the temperature favourable? No, that temperature is too hot. You’ll need to keep them in a controlled climate until it cools if you want them to live and produce fruit. I’d recommend reading this. Good luck! Hi new grower here, I froze 2 different seeds, probably hybrid seeds off a store-bought strawberry, and a packet purchased in a strawberry kit. I froze both. Living in Minnesota, when I take them out in May or so, its tricky getting enough sunlight here, as well as temperatures are unpredictable at best. My question is, how many hours of sunlight do my sprouts need per day, as well as what is a good amount of water/moisture for healthy growth? Thanks! I’d recommend reviewing the information on the Growing Strawberries reference page! Good luck! I’m VERY new att planting anything. In history I’ve been known for killing my plastic flowers. But now I’ve got 2 kids that really likes the wildlife so I’ve been trying to grow strawberries from seeds (some climbing strawberries). Now I planted them in a glass and keep them humid under a airhumidizer standing in the window. When will I and my kids see any development (read: Green) in the glass? It can take a couple of weeks for the strawberry seeds to germinate, so be patient! You also might want to be careful about the humidifier. Too much humidity can help strawberry plants get sick with fungal diseases. Good luck! Do strawberry seeds “expire”? I have a packet that says it needs to be sold by 12/2015 and also that it was packaged for 2015. Thanks in advance! Sort of. Strawberry seeds (and most others) are susceptible to losing their vitality as they age. The longer each individual seed goes without germinating, the higher the chance that it will never germinate. Usually, however, in a packet of seeds, there will be a fair number that will still germinate and grow into strawberry plants, even if a lot of them don’t. Good luck! How much time does strawberry need to germinate ? Most strawberry seeds will germinate within 2 weeks. Good luck! I live in India and have purchased Alpine Strawberry seeds (Baron Von Solemacher). Do I need to cold stratify them, for how many days?, in deep freezer or otherwise. This should tell you everything you need to know about germinating strawberry seeds. Good luck! Can anyone suggest a strawberry variety that will do well in zone 10? Zone 10 is hot for strawberries, but you may want to give Chandler a shot. It can perform well in Zone 9, and may do well for you just a bit further south. Good luck! I’d recommend you review this information about seed germination. Good luck! Do you know if Hokowase Strawberry Seeds need to be cold treated? It can’t hurt to cold treat them, but all varieties don’t have to be cold treated. It usually does increase germination rates, however. Good luck! Excellent site. I am a newbie to this area and I had a few questions that cover various topics that you have included in your website. I have tried scanning the documents for answers, but I also thought I would ask you. Thanks for your patience. 1. I recently bought some regina strawberry seeds, the packet does not mention anything about them being preconditioned, therefore to precondition them I should place them in the freezer for a month before planting? Is that correct? 2. I live in a very hot desert climate, therefore my growing method will be hydroponics in a controlled climate environment. I plan to sow the seeds in either rock wool or coco coir, do you have any experience with these two growing mediums and therefore any advice on what would be best, what to avoid etc? 3. Given that I will be creating the ideal growth conditions in a controlled climate, does it then become irrelevant at what time of the year I sow the seeds, as the ideal growth conditions will be present and maintained. 4. When seeding in the growth medium should any fertilizer or nutrients be added to encourage growth, if so, what fertilizer/nutrient should be used in what concentrations? 5. Once the seeds have sprouted I plan on using an N-P-K fertilizer with the following concentrations, 24-12-32. Any advice regarding that? 6. From what I have read, it seems that hydroponics methods for most plant based fruits and vegetables is a quicker process than conventional gardening. Any truth to that? If so what type of growth cycle can I expect? In general, it is a good idea to cold-treat seeds prior to germination. It is not absolutely necessary with some varieties, however. If your packet didn’t instruct preconditioning, they should germinate adequately without it. I’d use coco coir over rock wool. Since you’ll be growing in a controlled environment, it doesn’t matter what time of year you germinate the seeds. As for fertilization, you don’t need any extra to get the seeds to germinate, but I am unfamiliar with the best concentrations to use in hydroponic systems, which can grow fruit more quickly due to consistent optimal nutrient delivery. Hope that helps, and good luck! I moved to Belize several years ago from the US. I have been missing strawberries since they are quite expensive if/when you can find them here. I decided to grow my own since I had done it in the States. I finally tracked down a tiny plant which I have put in a pot on my patio with a good soil mix and it seems quite happy. I have learned here that the sun is very intense and things that require full sun in the States will burn here, so my little plant gets the morning sun and then shade after about noon. Now,my little plant was quiet pricey, so I only got one and I need more. Of course the supplier has no clue what kind of strawberry this is so I don’t know where to go from here because I want lots more plants. I’m wondering if I should pick the flowers and hope for runners or if I should let it fruit and try to harvest seeds. I’m kind of lost here. Any advise is needed! If the plant was potted and growing when you got it, you probably can allow it to set fruit, if it will. However, in hot climates, the roots warm to a temperature that makes vegetative growth happen instead of fruit production in many cases. Good luck! Why is it that some strawberries grow with LOTS of seeds on the outside? Thanking you in advance for a reply. 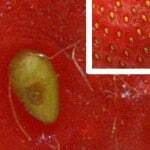 The genetics dictate the achene formation on the outside of the strawberry’s accessory tissue. The seeds are actually contained within the achenes. Hope that helps! Thank you for this article!! I just picked a few seeds off a few strawberries i bought at the grocery store. Are those ok to use to start plants and how do i care for the seeds while i am waiting before planting them? Yes, you can save and start seeds from strawberries you purchase in the store, but those strawberries are almost always hybrids. That means it is totally random as to what type of strawberry plant will grow from the seeds. Store the seeds in the refrigerator until you plant them. Good luck!